When Pan Am 103, a Boeing 747-121 named ‘Clipper Maid of the Seas’ fell out of the sky on 21st December 1988, few people had even heard of the Scottish town of Lockerbie. But it is a name that over the years has become synonymous with the major aviation disaster, in which 259 passengers and crew of Pan Am flight 103 and 11 residents of the town itself lost their lives. Pan Am 103 had taken off from London-Heathrow at 18.25 hrs bound for New York’s John F Kennedy International Airport. Many of the passengers aboard were returning home for the Christmas holidays. After take-off the aircraft had been cleared to climb initially to FL120 and subsequently levelled off at FL310 north west of Pole Hill VOR, a radio navigation beacon not far from Penrith in Cumbria. At about the same time control of the aircraft passed from London to Scottish air traffic control centres as the Maid of the Seas changed headings slightly to intercept its entry point for the long flight over the North Atlantic. Approximately seven minutes later Shanwick Oceanic Control, based at Prestwick in Scotland, transmitted the Oceanic clearance to Pan Am 103.But this message was neither heard nor acknowledged. Instead its primary radar blip and accompanying secondary radar return disappeared from screens at the Scottish air traffic control centre, and were replaced by multiple primary radar blips which appeared to be fanning out downwind for a considerable distance from the last known position of the Clipper. 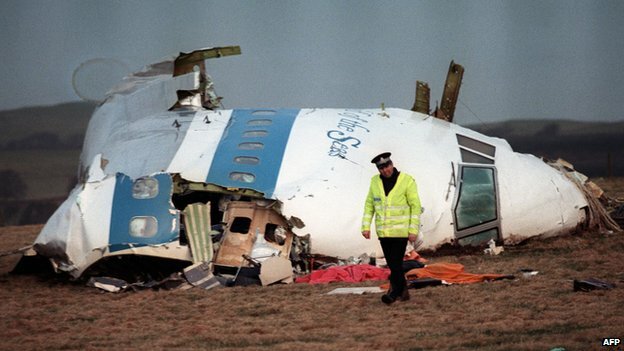 Pan Am 103 had, it appeared, simply disintegrated in-flight over the town of Lockerbie. For the residents of Lockerbie, a nightmare was about to begin. Pieces of the plane, as well as pieces of human bodies landed on rooftops, gardens and surrounding fields. 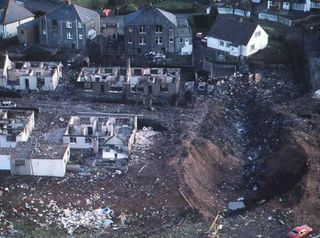 One of the wings hit the ground in the southern area of Lockerbie, srtiking the ground with such force that it left a crater, displacing 1,500 tons of earth. The Boeing 747′s cockpit landed largely intact in a field. The aircraft’s name was clearly legible and it was the largest recognisable piece of debris. Wreckage from the crash spread over 50 square miles. 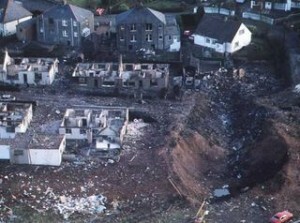 Twenty one of Lockerbie’s houses had been completely destroyed, and eleven of it’s residents were dead. The task of checking and clearing all the weckage was a grim and nauseating task because investigators need to find out exactly what had happened to Flight 103, so victim’s bodies had to be left lying exactly where they had fallen for several days. They also had the daunting task of reconstructing as much of the fuselage of Flight 103 as possible. Investigators discovered that the terrorists had concealed the IED inside a transistor radio packed in a suitcase, checked onto the flight. At the time of the Lockerbie disaster airport security was considerably more relaxed than it is today. Although passengers boarding flights were required to pass through metal detectors and have their hand baggage examined for the presence of concealed weapons, their hold baggage underwent few security controls. It was this fact that seems to have been exploited to devastating effect in the tragic loss of Pan Am 103. Today all international air passengers are required to undergo profiling which is designed to assess through a few simple questions whether or not they could present a risk to the safety of the flight. Each passenger is also required to pass through a security checkpoint and have their hand baggage x-ray scanned for the presence of concealed weapons, and at the same time their hold baggage is thoroughly screened for explosive materials. As a final line of defence every passenger boarding an international flight is electronically matched with baggage in the belly of the aircraft. In the event a passenger does not board his or her luggage must be off-loaded before the aircraft is allowed to depart. In 1997 the United Kingdom became the first country in the world to adopt the practice of 100 per cent screening of hold baggage. The United Kingdom approach to hold baggage screening has since become the defacto standard for many other countries around the world. The number of countries applying 100 per cent screening continues to rise year on year. Many of the security standards and procedures in place at airports today are the legacy of the tragic loss of Pan Am 103, and help to ensure that such an atrocity cannot easily occur again.